August was my first Fresh from the Oven challenge, and it hasn’t been without some difficulty. For a start, you’ve probably noticed that it’s 1st September; I’ve been on holiday for much of August, and although I baked my loaf several weeks ago, I just haven’t got round to writing this post. Secondly, as it was my first challenge, I wasn’t sure whether to stick with a more classic loaf to confirm my baking credentials, or to go all out with a wackier combination of flavours. This month, Sally from MyCustardPie set the task of incorporating vegetables into bread, having made a beautiful courgette cluster loaf herself. My initial reaction was to try something a bit different; could a bright pink beetroot bread be made? Potato and rosemary sourdough is a wonderful loaf but I’ve made it before, vegetables like aubergines and peppers felt like they might have the wrong structure, and somehow a carrot loaf seemed like it might be a little sickly-sweet; I wanted to make a loaf I’d actually want to eat. 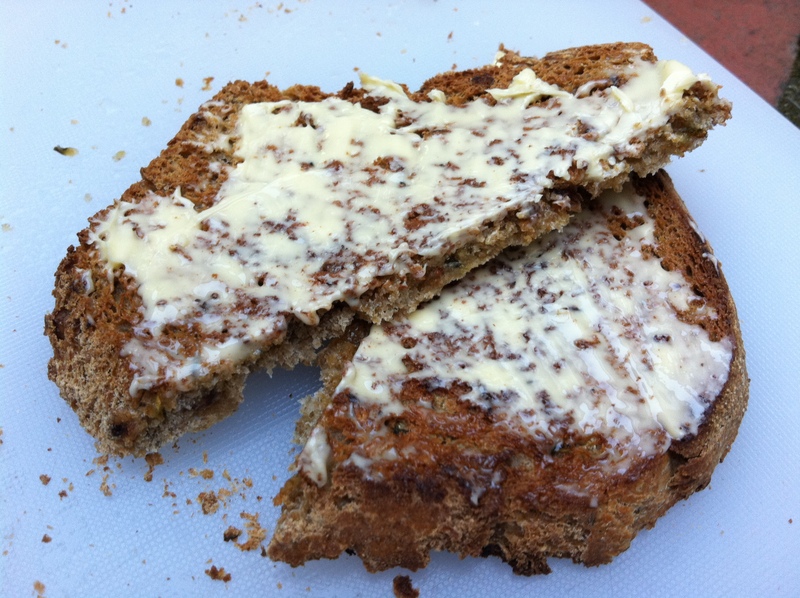 After much deliberation, I decided to stick to the basics and go with a slight variation on Sally’s courgette bread – I could imagine the grated green flecks creating a lovely texture within a nutty wholemeal loaf. While browsing Borough Market a few weeks ago, I’d noticed these pretty little loaves baked in flower pots. While aesthetically pleasing, with crusty tops peeking over their terracotta rims, they’re also a great size and shape, producing taller, more satisfying slices than your average little loaf. It may be a gimmick, but I was sold, and popped down to my local garden centre to purchase a pot in which to bake my bread. The resulting loaf was absolutely delicious. A mixture of wholemeal, malted and rye flowers created a nutty foil for the grated courgette and the texture was soft and slightly dense (in a good, wholesome sort of a way). Baking in a slight hurry, I made a few minor mistakes – I didn’t score the top properly meaning I didn’t get the beautiful, broken crust of the Borough Market versions, and I’d planned to sprinkle with poppy seeds before baking, which I completely forgot to do. However overall I’m really pleased with my first Fresh from the Oven loaf – I’ll definitely be using courgettes in bread again, and I can’t wait to see what next month’s challenge brings. Place the courgettes in a colander and sprinkle lightly with salt. Allow the juices to drain for about half-an-hour, then rinse well in cold water, squeeze out any excess water and pat dry. Mix the flour, yeast and salt together in a bowl, then stir in the olive oil and courgettes. Add water until the mixture comes together as a firm, soft dough. Knead the dough on a lightly floured work surface until smooth and elastic (about 10 mins). Lightly flour a clean bowl and put the dough in to rise, covering with a cloth or black bin liner. Leave for approx. one hour or until doubled in size. Once risen, knock back the dough in the bowl, then turn out onto your lightly floured work surface. Knead again briefly until smooth. Preheat your oven as high as it will go. Lightly grease and line your flower pot with baking parchment. Place the dough inside the pot. Brush with a little water, and sprinkle with poppy seeds (if using). Cut a slash or two across the top to help the dough expand and rise, then cover again with your cloth/bin liner and leave to prove until doubled in size – about 30 minutes. Put into a preheated oven at the highest temperature for about 10 minutes. After 10 mins, reduce the oven temperature depending on how quickly the crust is browning, and cook for an additional 40 mins or until golden brown and cooked. Cool on a wire rack then serve toasted, or simply sliced and drizzled in olive oil and salt. *Tip: Use a very clean clay flowerpot to bake this loaf. Before baking, generously rub the insides all over with vegetable oil then place in a 200 degree C oven and let them bake for 1 hour. After this treatment, wash the pot in warm water and allow to dry completely. If you notice any sticking, repeat the treatment. Ooh, I can see how the market ones would have been so inspiring. Will you bake flowerpot bread again? Or will you plant in that pot? 🙂 I also stuck with courgettes, and loved the green specks that peeked through the tops of the buns. Welcome to the group! Welcome to the group! These look so fun much fun! Great shape and texture. 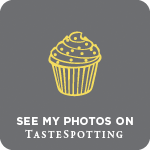 London Bakes – ooh, I haven’t watched the baking episode yet, but got it recorded! Can’t wait 🙂 Thanks for your lovely comment – will try to get some more bread recipes on here soon! As someone who is abit scared of yeast and has yet to make her own bread, i am in awe of your talent for baking bread. I need to get practising! 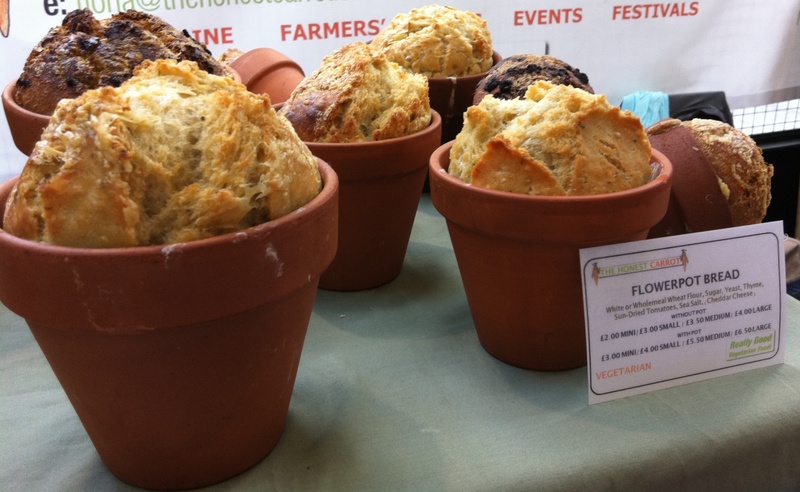 I love that you made bread in a flower pot -so brilliant – it looks gorgeous – I saw them at Borough as well but am impressed you did it yourself! Gourmet Chick – thanks! Normal shaped loaves involve a little less stress, but it was lots of fun to give it a try! I read your “about” page and see we have so much in common with our love of bread and being drawn to more natural ingredients. I love making bread but honestly am still learning to make some of the simple ones. I’m a bit of a perfectionist (get it legitimately from my father) and find I’m still lacking the courage to dive into enriched breads and things like bagels, pretzels etc. You have some incredible recipes and ideas, some so unique. I definitely will be stopping by again and again. Thanks for visiting The Butter Dish, you are welcome any time. Welcome to the group and thanks for taking part this month. 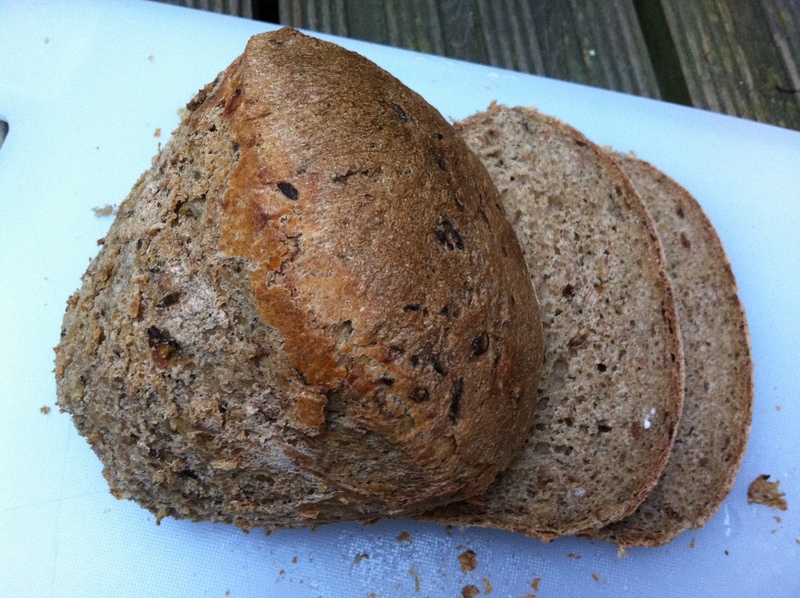 Your bread looks fantastic, love that you used wholemeal flower. I found a recipe for mini flower pot breads last year and still haven’t got round to buying the pots, let alone baking the bread! May I ask what size pot you used? A 3″ or 4″ or 5″ or all three sizes? Thank you so much for responding.